Whether you need an event center for a corporate meeting, family reunion, perfect wedding day, or a retreat for your employees; the Preserve at Bingham Hill is the perfect place. From the moment that you come to visit the site and begin the planning process to the conclusion of the event our staff is attentive to your individual tastes and requirements. We offer pricing that allows you the flexibility to create a one of a kind experience. We understand that a wedding is a very personal event and that each couple wants to have a wedding that they can call their own. The ownership and staff at The Preserve strive to provide a ceremony and/or reception that are as unique as the two people getting married. Whether you desire something very elegant or very rustic, our property and staff has the flexibility to allow you to be creative in order to fulfill your dream wedding day. The Preserve at Bingham Hill is a perfect off site meeting venue. It comes complete with calm, inviting surroundings ideal for inspiring productivity, creativity, team building, client entertainment, employee appreciation and more. Our unique setting allows for small break-out meetings or larger group meetings to gather outdoors or inside our Event Center. Located along beautiful Bingham Hill Road, we are close to bike trails, hiking, horseback riding and whitewater rafting down the Poudre River. Our staff works closely with local caterers and other vendors to bring you that one of a kind meeting experience. ? We welcome the opportunity to custom tailor an experience just for you! Whether it's graduation, a birthday, retirement, an anniversary, reunion or other special occasion, when a milestone is reached, we agree. It's time to celebrate! At The Preserve, we endeavor to make each party a singularly unique event that will create memories for a lifetime. From the moment that you come to visit the site and begin the planning process to the conclusion of the event, our staff is attentive to your individual tastes and requirements. We offer pricing and customized layouts that allow you the flexibility to create a one of a kind experience. The Event Center offers the flexibility to accommodate wedding ceremonies and receptions, parties, indoor meetings, team building activities, luncheons, dinners, or recreational events. With views of the outside looking over the tree covered grounds, this room allows meeting participants to embrace a wonderful outdoor setting in the comfort of the indoors. The Event Center can be transformed into an elegant setting for the most discerning taste. Guests have access to a full catering kitchen, restrooms, and changing rooms. 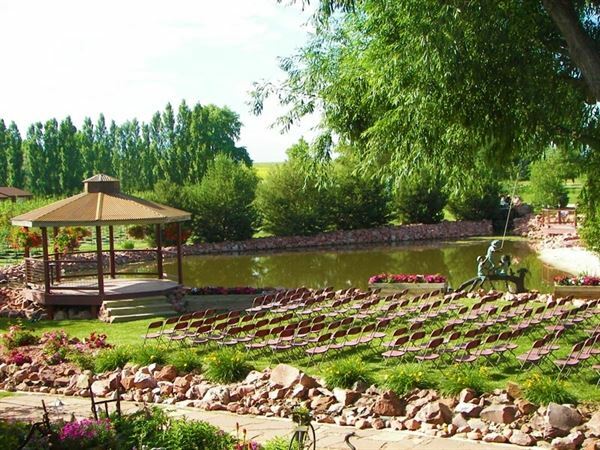 Surrounded by a trickling brook, Colorado red rock, flowers, trees, a pond teeming with bass, gazebos, a covered bridge and a sandy beach, lies the Front Lawn, an expanse of lush, green grass that plays a central role in nearly every event at The Preserve. Whether guests are seated for a ceremony, a celebration, or a retreat, the beautiful setting comes complete with the sounds of nature and the convenience of our modern facilities. This is an incredibly beautiful place that is a hidden jewel in Ft. Collins. The whole experience definitely made my wedding day special.